From sleepy eyed mornings trying to scramble for your razor to late nights standing in front of the mirror with a string of floss, your bathroom is an important part of your everyday life. Often the smallest room in your home, your bathroom can reap big rewards when it comes to just a few simple organization upgrades. Who says every bathroom’s organizational pieces have to all come from the same aisle at the department store? Get creative with how you set up your bathroom with innovative, stylish storage. 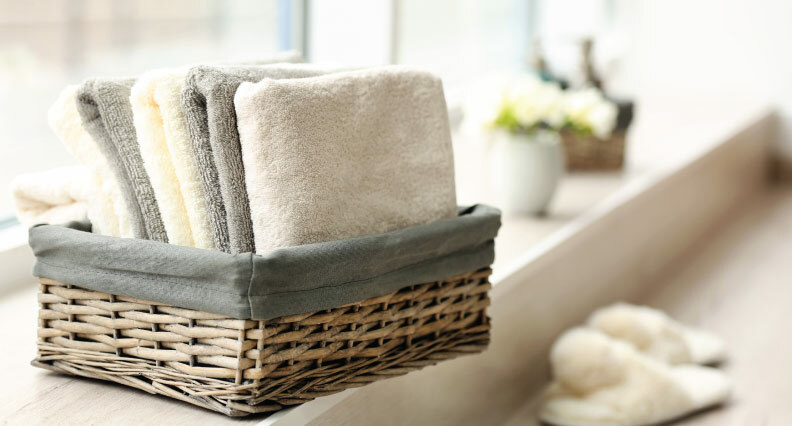 Whether mason jars lined up on the counter for your toothbrush and q-tips or a wicker basket set in the corner for towels, picking nonstandard pieces for your bathroom will help give your small space big personality. In a space known for small square footage, one of the best ways to make an impact is through hanging elements. Whether a second rod in your shower that allows towels or clothes to dry behind the curtain, or shelves mounted on the wall, creating hanging space in your bathroom opens up your overall floor plan and usability instantly. One of the best organization tips for any space, including your bathroom, is to give every place a dedicated purpose. This is most easily achieved through tools like drawer dividers, which can be adjusted to fit exactly what you need, ensuring everything gets a proper home. From ponytail holders to toothpaste to even tweezers, make sure everything in your bathroom has a space within a drawer divider, and stick to the system for optimal continued organization. If you’re really in need of more storage and organizational space in your bathroom, partner with the professionals at Mission Kitchen and Bath to upgrade your base or vanity cabinets. From increasing size to ensuring all of your spouse’s hair products have a proper drawer to call their own, our professionals will help you find and build the perfect cabinets for your space, that will help you stay organized for years to come. Stop shoving toiletries into random drawers and lining your countertops with row after row of products. Instead, organize your bathroom with these creative tips and by partnering with the experts at Mission Kitchen and Bath to give your space the upgrade it deserves. To learn more or to start organizing your own bathroom visit Mission Kitchen and Bath today.